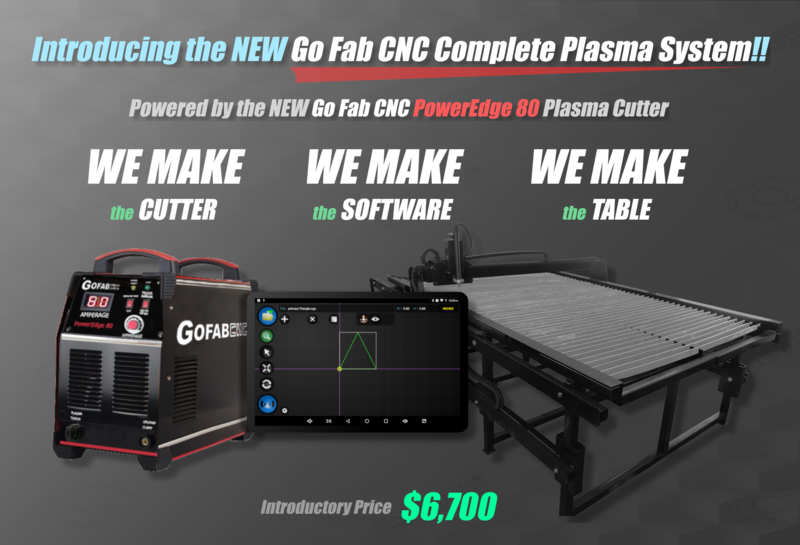 Go Fab CNC – Go Fab CNC Plasma machines are built to last and can handle just about anything. We fabricate all of our machines right here in our own shop and write all of our own software - allowing us to build a machine that's very cohesive and very cost effective. And now, we make the Go Fab CNC PowerEdge 80 Plasma Cutter - meaning we have a completely connected system! Go Fab CNC Plasma Tables are ready to work and serve as the backbone for businesses in multiple industries from Off-Road Vehicles to the Oil Industry. Our tables can be loaded with sheets of steel by forklift, overhead crane or by sliding a sheet of steel across the table from any side. We use an all steel construction with self-tightening steel rack & pinion drives. Our tables can take substantial abuse and require almost zero maintenance. We run our shop machine every work day for up to 12 hours straight without any resting periods! All Go Fab CNC Tables use a Wireless Touchscreen Tablet for operation - no stationary computer, no wires, no fuss! You don't need experience with CNC machines or Plasma Cutters to use a Go Fab CNC Plasma Table. All of the settings have been pre-programmed and operation is as easy as tapping a screen!